BB: Hello everyone, and welcome to Depth Insights, where we take a depth psychological look at news, topics, and events that are going on in your world. I’m Bonnie Bright. My guest for the show today is Les Lancaster, who is a researcher and scholar in Transpersonal Psychology, and Les’s interest in consciousness, spirituality, and Transpersonal Psychology have led him to his current life’s work as the Founding Director of Alef Trust, which is a UK-based educational organization that offers post-graduate programs as well as open learning courses in consciousness, spirituality, and Transpersonal Psychology. So we’re going to dig into the whole topic of Transpersonal Psychology today and compare and contrast it with Depth Psychology, among other things. Meanwhile, Les, thank you so much for spending some time with me today. BB: Well, I’m so happy to have you here because I think that Transpersonal Psychology was probably, for me, the precursor to Depth Psychology. I sort of discovered both of them right around the same time, and they both had a really tremendous impact on my own life, personally. I can go more into the story, I guess, as we have our conversation but I experienced a pretty profound awakening that was really of a transpersonal nature, and that led me to Stan Grof’s work, which led me into Holotropic Breathwork and Transpersonal Psychology, in general. Some of these terms may not be as familiar to our listeners but we are going to break them down and we will get into that momentarily. But first, Les, I’m going to read your bio so that everybody has more background on you. Brian Les Lancaster is a founding director and currently academic dean of Alef Trust. He is also a Professor Emeritus of Transpersonal Psychology at Liverpool John Moores University in the UK, and Associated Distinguished Professor of Integral and Transpersonal Psychology at the California Institute of Integral Studies in the U.S. (also known as CIIS), and an Honorary Research Fellow in the Centre for Jewish Studies at Manchester University, also in the UK. 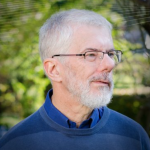 He is currently a Board member of the Association for Transpersonal Psychology and has previously been Chair of the Transpersonal Psychology Section of the British Psychological Society and President of the International Transpersonal Association. Les is Co-Founder and Co-Director of the Sacred Science Circle. So, Les, there’s a lot in your bio there. Obviously, you have made quite a career of Transpersonal Psychology. Maybe we should start there and discuss a little bit about what Transpersonal Psychology is for those who may not know at all, or who may have some inkling of it but aren’t quite sure. And then I’d like to have us look together at what the differences are between Transpersonal Psychology and Depth Psychology. LL: Okay. That’s a great place to start. Transpersonal Psychology…well, I didn’t start my career as a transpersonal psychologist. I think I should say that initially. My background is in neuroscience, cognitive science, but throughout my adult life, I’ve been fascinated about issues of spirituality and mysticism, especially mysticism. And you know what brings it all together is the mind, understanding the depths of the mind. So Transpersonal Psychology, well, let’s look at the word “transpersonal.” Now, there’s a sphere of our lives which revolves around our personality—who I am—what we call the ego. And what we learn from many areas, mysticism and spirituality amongst them, but also Depth Psychology—what we learn is that the ego is only one small part of ourselves. So Transpersonal Psychology is interested in what goes beyond on that small part of ourselves. And I guess there’s a theoretical side to that. One of my areas of interest is the nature of consciousness. Now, so what is it about consciousness that goes beyond the immediate sense of the ego? And in an applied sense, how do we assist people in making these journeys which go beyond that immediate sense of the personality, to explore the farther reaches, the deeper nature of mind, and the world of which we’re a part? So, I would say Transpersonal Psychology is the psychology that acknowledges that there is so much more than is there in the immediacy of our ego-based consciousness. BB: Yeah, I really appreciate that, and I imagine that a lot of people who have been following Depth Psychology specifically for a long time will assume that there is a lot of overlap between the two fields because Jung is also considered one of the pioneers of Transpersonal Psychology. At least, he is one of the major contributors to some of the theories of it. And also, his collective unconscious—the ideas and notions of how that collective unconsciousness work as a repository for so many of these things that we don’t know. We talk about all these things that are beyond our ego, but we can’t even fathom what the great Mystery of many of those things are. Of course, they come up to consciousness in various ways. And one thing that I do like about Transpersonal Psychology is it seems to have a real initiative to find and utilize some of these tools and vehicles to actually gain access to those unknown or the unconscious parts of ourselves, and our psyches, and the world, and the universe. LL: Yes and you mentioned Stan Grof before. So a great example of someone who developed tools to approach…So when he started, he was using psychedelic drugs. And then he developed ways to use special approach to breathing, Holotropic Breathwork, heightened breath work, and a lot of music and sound and so on. So these are techniques. I mean, there are many techniques over the centuries. We can go back to the shamanic origins of so much of the early human societies, drumming techniques, and especially using the breath, practices of meditation, practices using a sense of the divine—however that is understood. But if we talk about the early ages now a sense of the divine that is infusing everything within us, outside of us, and the breath is that which unifies, brings together what’s beyond us, what’s within us. So, practices that really focus into the breath. So, there are many ways over the ages that humans have explored that which is beyond the immediate aspect of mind. So over many centuries, there are many practices. I mentioned earlier, Stan Grof, and he’s developed 20th/21st-century approaches but these are all based on ideas that are part of our common heritage. So yes, I mean, what you’re saying that Transpersonal Psychology it shares a great deal with that psychology. But I think maybe Transpersonal Psychology has become more fluid in its approach to adopting practices which have a longer history in terms of spiritual practices. Depth psychology has its own practices but they tend, they’ll have Freud and the free association approach that he used, hypnosis another technique that’s used, and Jung—you mentioned Jung—Jung’s a huge pioneer -there’s no question about that – and his approach to active imagination, really trying to amplify the imagery. The center of the psyche is about imagery, and Jung understood that so well, and his life work really was finding ways to amplify that imagery to let us…to enable us to connect with that fount of the imagination that is really the core of what it is to be human. BB: Yes…I mean Jung obviously was such a huge contributor to so much of the theory and the ideas around consciousness, but also he was willing to adopt some of the teachings, and ancient teachings at that, from eastern practices and mysticism, obviously. But I think that he was in fact somewhat limited because at least in the beginning of his career and throughout several decades of it, he was trying so hard I think, to be the scientist, and to make sure that psychology, the budding force that it was, would be kind of fitting within a certain set of rules, I guess you could say—and I don’t know to what extent that we can really say that he succeeded at that because obviously the more of these mystical experiences that he had, and his Red Book being a good example of that—I think the more he was willing to say that it can’t all be defined by science, and he was more willing to allow a little bit of those pretty strict boundaries that he had set around Depth Psychology at the time. But I’m wondering if you can say something about the scientific aspects of Transpersonal Psychology and how that is viewed currently. LL: Yeah. And again, you’ve put your finger on something very important here. Psychology is a scientific discipline. There’s an interesting balance between the extent to which we are conditioned by our culture, the time we live in, and sometimes when individuals, maybe rare individuals, can break through a little bit perhaps, a bit more… We talk about paradigm shifts to go beyond that limiting time and place. Jung is one of those individuals. But he…exactly what you said: He was constrained. He wanted to come across as a scientist, and it was a challenge to him for most of his career, actually. You’re right. In the last years of his life I think he felt more freedom in that way. But let’s not talk about Jung because we’re speculating a little bit, but I’ll answer your questions about Transpersonal Psychology. But I mention that because I think it’s a crucial point. The science itself is changing, and there are huge movements, really big movements today towards what we’re calling post-materialistic science. And that’s a whole subject in its own right. What is science? Science is a way of pursuing knowledge. Now of course there are many ways of pursuing knowledge. Science is a particular way which uses a certain set of rules around experimentation, that in some ways we’ve almost come to the limits of where that has led us. All the great advance in science of the 20th century for example, that about experimental work to confirm hypotheses, etc., but when you look at the leading edge of, let’s say physics, which is probably the queen of the sciences today, rely on experimental verification is not always possible. And I think that’s true in psychology as well. There’s a huge amount…I mean, psychology is a scientific discipline of the 20th and early part of the 21st century. Now, so much has been discovered through scientific psychology. But the areas that we’re interested in, we’re talking about here, it’s not always possible to put in onto a short scientific putting. And I spent most of my career exploring and writing about is that a consciousness, now, there’s a good place to start. Many would suggest that consciousness is a product of, let’s say, the human brain. Maybe some other animals have consciousness, I don’t know. It’s a product of the physical processing of the brain. That seems to be kind of a faith backdrop for so many, for example, many neuroscientists interested in consciousness. But it’s just that, it’s a faith. And we have no solid evidence to say that consciousness is nothing other than a product of the physical process in the brain. And my background is neuroscience, I know all this research. The fact is, that I signed up to a post-materialistic view of science. I think the consciousness which is right at the core of these questions is something that we are never going to understand fully if we restrict our lens to a lens of physicalism. So I would say that there is something about consciousness which is in transit to the whole cosmos. It’s not solely a product of the human brain. The human brain, maybe, is the most exquisite focus of consciousness in many ways, so we are conscious and we are conscious in particular kinds of ways, and we could look at all that in scientific ways. We can focus into the brain and which part are doing what in the process and so on. But the real question that is tucked in there which is about the essential nature consciousness, science, as we know today, is not going to answer that question. So when you ask me about Transpersonal Psychology and how it relates to science, there’s so many stands within Transpersonal Psychology, but I think the bottom line—and the point that I would make in answer to your question—is that we transpersonal psychologists are part of a movement to extend our paths to knowledge. And so we’re not constrained by, what I would say is, an outmoded vision of science. BB: Yeah. What you’re bringing up is really important here because I think that a lot of people probably had this idea that Transpersonal Psychology, particularly, and some other kinds of psychologies, including Depth Psychology, are really quite highly based on the idea of spirituality, that there is not necessarily so much of the brain science behind it. But, in fact, actually, Transpersonal Psychology really started to come into being in the 1960s when we began to have, also, a movement in the capacity for us to measure the brain with new kinds of tools and that sort of thing, too. 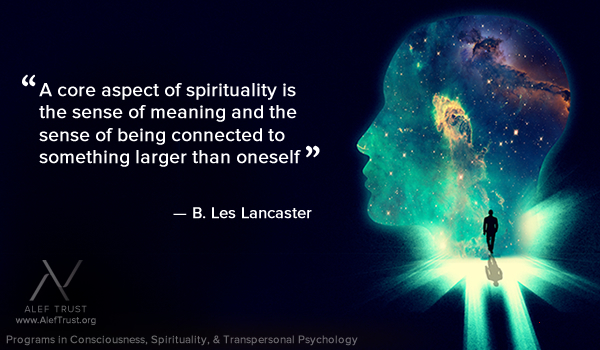 So can you say a little bit more, though, about spirituality and Transpersonal Psychology? We’ve talked about the consciousness aspect of it, but we also know that Transpersonal Psychology, one of its aims is to really explore this so-called mystical experiences that you had mentioned earlier. So I’m wondering if you can say something about that. LL: Yeah. And the first thing I say, just on the last bit you said—because I think it’s important—to explore mystical experience, but also to distill what is valuable—and often there are aspects which are not valuable—and how do we make those differentiations? And I think the goal of Transpersonal Psychology or one of them is to refine our understanding in order to be able to reach these higher states—however we understand that—and to do that in ways that are safe and wise. But, you asked about spirituality. Of course, this game is about culture. It’s about society. It’s about the time and the age we live in. The word “spirituality” was hardly used going back 50 years. So the fact that this term is so strong in our culture today, it says something about the direction we as a culture are taking. It’s not just a word: it’s a way of envisioning things, right? So spirituality is understood as being different from religion, for example. Religion today—the word “religion”—yes, that was there 50 years ago. There’s a whole history there. So what’s changed is shift between the sort of institutional structures of religion being to the fore—a shift from that to the more inner experience being central. And we understand by the term “spirituality”. It’s very difficult to define spirituality. When many people have spent many, many words on that. But I think a core aspect of aspect of spirituality—and I say this because I can link into what it means by transpersonal—a core aspect of spirituality is the sense of meaning and the sense of being connected to something larger than oneself. So Transpersonal Psychology takes that as a foundation. You said that it has its origins in the ’60s where at the moment, we’re celebrating the 50th of the jubilee of Transpersonal Psychology. And that was a time—’60s, early ’70s—a time of great exploration, exploration of the mind, very interesting period in terms of culture evolution. So Transpersonal Psychology, I would say, is the branch of psychology that is not constrained by trying to put everything into a sort of physical or materialistic framework. You mentioned before that that maybe goes for Depth Psychology as well. But in some ways, it’s not such an easy division to make, as the term “Depth Psychology” itself is quite difficult. Well, I mean, it was first introduced Bleuler working with Freud. And Freud liked that term—although he meant for psychoanalysis—but he liked the term “Depth Psychology.” But he didn’t include spirituality as part of the framework that he was exploring. Although, again, that’s another story there, some interesting aspects about that, but it will take us too far on a tangent. And so the term “Depth Psychology” covers such a broad area and, again, it has changed over time. So I think when you say about spirituality being within Depth Psychology, that wasn’t always the case. But because of the changes in our cultural society that are referred to, I think now, many, many people associated with Depth Psychology recognize the importance of the spirit and how to cultivate the work of the spirit. But, again, another point—I said spirituality is about connecting with something larger than ourselves…larger than what? Larger than the ego, okay—so we can say well there’s something more than the ego and the psyche—the Self, for example, the way Jung talks about that. So spirituality is about connecting to Self. But so many aspects of the older ways of viewing this have significant ontological implications. In other words, it’s a question of how we view reality. And this relates to what I said before about science and materialism. So I would say that you are not going to fully engage with the work of the spirit, or the soul— the phrase I used before—you’re not going to fully engage like that without embracing something beyond a materialistic ontology, and this is a struggle between Transpersonal Psychology and many other branches of psychology. I think that if we can’t recognize that there is something more to our world than the purely physical, then it’s as if we’re trying to do Transpersonal Psychology with one hand tied behind our backs. BB: Right. Yes, and I think—just to close on Jung because, obviously, he’s somebody that has been very inspirational for me, and I have my long history myself in Depth Psychology—but for me, I’m trying to figure out how to hold that balance between the two and to really begin to understand what each one offers that is unique, and again, of course, where they overlap. So I think this idea of spirituality and being related to something larger is really at the core of both of them. And I very much appreciate that because there is a quote by Jung which I really love and he says, “Is man related to something infinite or not? That is the telling question of his life.” And, of course, that does carry down to this. I’m thinking maybe, as I hear you talk, that part of the difference— and I think you alluded to that actually— is that the time frame or the time period within which each of these two started. So you had talked about how the ’60s were such a time of transition worldwide really but particularly, of course, we know in the US and also in Europe to a great extent. And when Jung began and Freud, they were back at the turn of the 20th century. 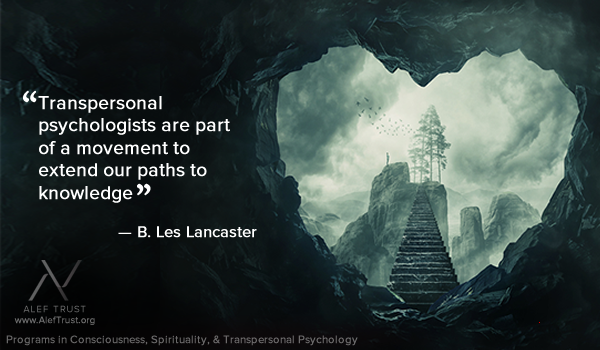 They had their roots more in the Victorian era, and definitely had a different mindset, and even a different culture, whereas in the U.S. where Transpersonal Psychology really was a completely different culture. Can you say something more for our listeners about the history of how Transpersonal Psychology came together? And it can be brief, but I’d like to just make sure that everybody has an understanding of that. LL: Well, I think the first one to make is what you just said that it’s very much an American—It started in the US. And that’s very interesting in itself, I think, because when we compare it with Depth Psychology from Jung and Freud, these were products of the European mind. And again, it’s far too big a subject to go into, but many aspects of what Freud and Jung were bringing out has their antecedents in European history. Recent European history would also go way back, way back into the formative aspects of European philosophical tradition and so on. And the American tradition is different. And Transpersonal Psychology, I think, owes a lot to Walt Whitman and the transcendentalists, as it were which I think the American tradition was a much freer tradition. It’s interesting. I talked about culture before: another huge aspect in condition and culture is geography. America is huge. Europe is very small and historically, all these little places infighting and so on. And it’s not that America didn’t have its battles, but geographically, it’s a very expansive kind of environment. And so, I think it was the American consciousness that was there at the onset of Transpersonal Psychology. So the founders of Transpersonal Psychology, people like Abraham Maslow or [Anthony] Sutich, and Stan Grof himself, they talked about…they were connected with psychology. So they were part of the framework of psychology, academic psychology, and also the applied, the healing, the counseling, the psychotherapeutic side as well…Humanistics is another term to bring in there. So they were part of the overarching framework of academic psychology and its constraints. So there was this tension. There was this kind of constraining jacket from the academic world. And then, particularly in the 60s, there was this huge opening up, huge risk-takers. Yes, a lot to do with psychedelics. It was a very important factor in that, but it wasn’t just that. It was rediscovering or discovering for the first time, the more esoteric, the more mystical, eastern influences coming in. So it was a real melting pot, and yeah, and I think that’s always been the case. Again, we could talk historically about this. The crucial thing for Jung was discovering alchemy. And alchemy was very strongly influenced by the Kabbalistic tradition. Later in his life, Jung—you quoted Jung before—one thing that he said was that almost the entire gamut of his psychology was anticipated by an 18th-century rabbi, a kabbalist. Jung came to that later in his life, realizing that these ideas—the whole idea of the unconscious, we find in the Kabbalistic tradition, we find it in the Buddhist thinking, going way back. So, but happened in the States, in the 60s and the 70s, was this amazing integration. It wasn’t finally integrated, but the process started of exploring the mind; meditation was coming on stream. The recognition of Jung, again, was a huge, huge important factor there. Dare I mention the music as well, sitting here as I sit in Merseyside? Our famous four boys who shook the world? I mean, it was all part of that. And so, there was a desire, kind of a will to advance psychology in a way that it could relate to these issues because the core of all these things: the eastern influences, the psychedelics, and the spiritual side of—I think what brings them all together is understanding the human mind—or even the mind of God, if you want to get a little bit more poetical. And so it is psychology. And yet the root question in there is about psychology rediscovering its own soul. And these guys, Stan Grof, Abraham Maslow, etc., that’s I think their—when we look back and we say, “Well, what was their—what goes on their tombstone or whatever it is?” I think that’s it. Just about rediscovering this soul of psychology. BB: Yeah. That’s beautiful. I really like that. I hadn’t thought about that before, but it strikes me in a very important way I think in this moment. So we’ve talked a little bit about the exploration, the mystery of linking spirituality; the history of Transpersonal Psychology. Can you circle back around now and maybe say something about how all of this can be applied in everyday life, and through that, maybe a mention of some of the research that is coming out of Transpersonal Psychology? LL: Sure. Well, maybe a place to start is what some call the mindfulness revolution. You say, “How is it applied in our lives?” There has been such a shift. And this goes back to what I was saying before about cultural change and so on. Everywhere we look in our culture—our Western culture—at the moment, you see things about meditation or mindfulness. Now, this shift has come about on the back of what the pioneers of Transpersonal Psychology were trying to do. Yeah. So if we go back to the middle of the 20th century, no one, no one would put the head above the parapet in psychology and talk about meditation. Yeah. And that shifted because of the rise of Transpersonal Psychology. So when you say about the applications…Everything in life! It’s like, where isn’t there an application? The core of our lives is the way we find meaning, our own narrative, our stories. Our life is a journey, and we create the journeys and find our meaning—why we’re here. What our aspirations are. So there’s nothing more applied than that. That’s the core of everything, right? So the question is what feeds into those narratives. And the fact is that it’s actually a different world today. So for huge numbers of people, in especially Western society—it’s different in the East because they’ve got a different history and things are changing as well out East. And there’s a globalization, a huge thing here. So in terms of the applications, anywhere where we’re trying to enrich people’s life’s journey, then I think Transpersonal Psychology is there. It may not be there in name. You know, this is another interesting point. The term Transpersonal Psychology is not always received well, and that’s a question. Why would that be? But what I would say is Transpersonal Psychology is psychology—to use the image I used before—without the hand tied behind the back. So we can openly bring ritual, mystical, and religious ideas into our dialogues, and that becomes applied. There’s no question. Many people, whether they call themselves religious—or more, these days—will say that spirituality is a major value in their lives. So the work that we’re doing—you talked about research, research and meditation, that’s a huge area. My own work looking at Buddhist literature and how the insights into the nature of mind that we find in ancient Buddhist texts can enrich our neuropsychological understanding of consciousness, and that has implications not only in terms of well-being and the sense of flourishing in our daily lives, but also in relation to some of the limitations in areas like autism, or different neurological conditions where we’re trying to maximize the value in people’s lives in what are often very challenging circumstances—areas like hospice; areas like dying—how we enable people to die with dignity. I think that’s another area where the shift towards spirituality and a recognition, for example, of near-death experience. These are ways in which this is becoming very applied. I mentioned that one, near-death experience, that’s an area that transpersonal psychologists have researched in considerable depth, and they’re still challenging questions. Is a near-death experience just a product of the physical brain? Is it something larger? Is the person connecting with the mind outside of themselves? Is it about the soul journey? Many questions. But the fact is, however you address those questions, the notion of that kind of unusual experience is clearly on the agenda today. So Transpersonal Psychology has legitimized so much all these aspects of experience which don’t easily fit into the packages of a materialistic framework. BB: Yes. I really appreciate that. And, of course, all you have to do is take one look at the Alef Trust website and see these sort of courses that you’re offering there to get a really good overview of some of those aspects that we delve into from a transpersonal standpoint that maybe have not been as open in the long past. Of course, with the advent of Transpersonal Psychology, all of these began to open up in new and different ways for those of us who are kind of more mainstream, more everyday sort of people, who maybe have those spiritual leanings but haven’t really identified them, or haven’t identified what to do with them, in light of the fact that religion is kind of largely disappearing or changing quite dramatically. So I was just looking at some of those courses, and I see things like Creativity and Transformation, Kabbalistic Psychology, Shamanistic Psychology, Transpersonal Dreaming, Meditation & Mindfulness, Transpersonal Ecopsychology, Approaches to Consciousness, Transformational Leadership, Transpersonal Coaching Psychology—I could go on and on. And, of course, Alef also offers now master’s and doctor degrees in Transpersonal Psychology, consciousness, and spirituality. Can you just say a few words as we wrap up here how you actually ended up with Alef Trust and how that came about? What was your guiding force there? LL: Most of my career, I was at a UK university, Liverpool John Moores University. I was there as a neuroscientist. And over many years—I mean, I’m talking 40 years here—the challenge to bring what was initially a kind of side interest: my interest in mysticism, and meditation, and so on. Fifty years ago, I couldn’t bring those into mainstream psychology though they were crucially important to me—my own development, my interests, and so on. So I think the challenge of my career—and I think many in Transpersonal Psychology would say it’s the same—the challenge has been to, actually, bring what you’re really interested in into psychology. And it was a long journey, a long time. So I was fortunate to be able to, in John Moores University, I was fortunate some 20 years ago, I set up courses, post-graduate master’s courses in consciousness and Transpersonal Psychology. One of my colleagues there, Michael Daniels, we worked together to make this happen. And it was kind of revolutionary within academic psychology. So we’re part of the revolution in that way. After 10, 15 years of that, I wanted to be even more radical. And the university world has its own constraints, and so I felt—this is about 10 years ago—that I wanted to build something outside of that university, and joined forces with Jessica Bockler—she’s one of the founding directors with me. And she brings not only this interest in Transpersonal Psychology, but also working in the health sector, well-being. So it’s bringing together the academic, the scholarly aspects, but also a range of applications—how you can apply this stuff; it’s the question you asked before. And so, the Alef Trust, we set up the Alef Trust a non-profit company to give us that freedom to…Yes, we can do the academic stuff. And we are in partnership with the Liverpool John Moores University to offer these academic awards—Master’s, Ph.D.—to do that, but also to have this other side, the applications—both in terms of working within the health sector, but also in terms of working with groups of individuals who are trying to enrich their lives. I mean, that’s my area of application. I’ve worked with groups using ritual practices, using breathwork, using imagination, to find new ways of being. So the Alef Trust—that’s its mission; its mission is to bring this balance, because there’s a lot of interest in spirituality, etc., but some of it goes a little bit – what’s the word?—“wacky”—in the sense that it may be exciting and interesting, but it loses some of the grounding in good scholarship. So we’ve said, “Okay. Well, the Alef Trust—we recognize the importance of exploration of that—the shamanistic journey. And you mentioned we got a course on shamanistic psychology. We recognize that but we say it’s got to be grounded in the other strength of the human mind, which is reason.” And that’s the scholarly, the academic, the scientific—recognizing, like I said before—not science as a straightjacket; recognizing that science actually is going through something of a revolution itself now. So the Alef Trust, really—I like to think it’s at the leading edge of these changes. BB: Yeah. It certainly feels like it’s the culmination of so many of these threads that we’ve been talking about, and also your own career how it’s just all come together into one place where people can now look for self-transformation, or a degree in self-transformation, essentially, if that’s what they’re looking for. So it’s really an amazing accomplishment on your part, and so I congratulate you. I know you’ve been around for a few years now, and continuing to grow. And also, just so appreciative, Les, of your time today to talk about Transpersonal Psychology. Your passion for the topic is clear, and your knowledge and your background obviously have contributed in so great part. And so I really am grateful for the opportunity to talk to you. Thank you so much for spending some time with me. LL: Bonnie, I enjoyed you very much. It’s lovely talking with you. BB: Thank you. And so, again, I’ve been talking with Les Lancaster who is a researcher, a scholar, and also the founding director of Alef Trust. And you can find out more about Alef Trust at their website, which is aleftrust.org, and it’s spelled A-L-E-F T-R-U-S-T .org. Thank you again. 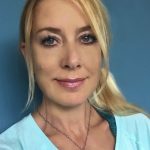 Bonnie Bright, Ph.D., earned Master’s degrees in Psychology at Sonoma State University, California, and in Depth Psychology at Pacifica Graduate Institute, where she also completed her doctorate. She is the founder and Director Emeritus of Depth Psychology Alliance, and the creator and executive editor of Depth Insights, a semi-annual scholarly journal. She regularly produces audio and video interviews on depth psychological topics. Bonnie is interested in ecopsychology, dream work, and divination, and has completed 2-year certifications in Archetypal Pattern Analysis via the Assisi Institute and in Indigenous African Spiritual Technologies with West African elder Malidoma Somé. She has also trained extensively in Holotropic Breathwork™ and the Enneagram, and is earning a certificate in Transpersonal Coaching Psychology via The Alef Trust.